Nick Anderson coached me for a little while. He is the real deal and a good coach. I am sure he would be interested to know that this clown is ripping off his advice without attributing quotes. I am not in contact with Nick anymore but he is on Twitter if someone wants to give him a heads up. Overall, that segment ( https://www.strava.com/activities/617330300 ) is a pretty good legit-run for him. 19.4 miles over 4h21m elapsed time with only about 35 minutes of non-moving time. Which makes it a great example to contrast to his non-legit runs. This one shows his classic run-walk style, constantly alternating between 8mph (running) and 4mph (walking), with his longest run under 2 miles as usual, and most runs around a half mile. The piece in video predictably highlights one of the "run" segments, which had been a walk just before the camera started, and returned to a walk just after the camera stopped. But that doesn't mean it was done just for the camera, as similar "run" stretches continue for the rest of the segment. 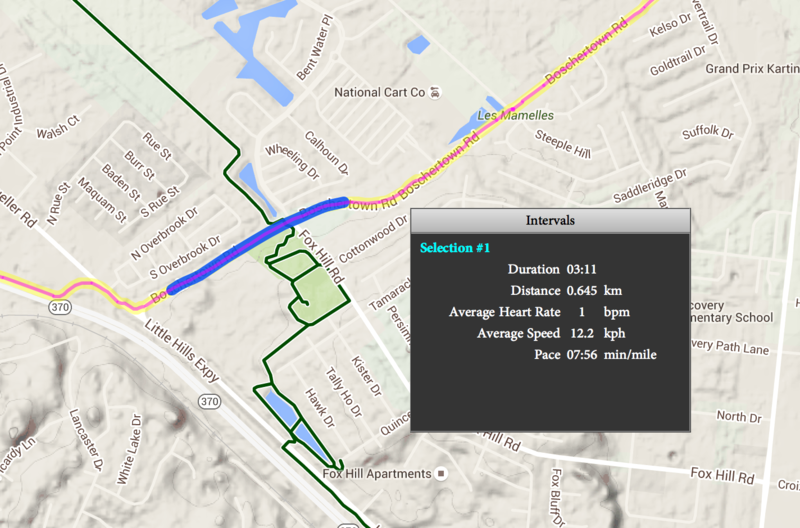 But it's not just the pacing that differentiates it from a 10-miles-straight-at-10mph RV ride. It's also the routing. In this one, he cuts across parking lots, grassy expressway interchanges, through back yards, over railroad tracks, taking any sort of short-cut possible. Just after the video stopped, they crossed to the other side of the road in order to cut the tangent and take the inner radius as the road curved. This is exactly the kind of routing you would expect from someone trying to minimize mileage so much that they did that crazy mountain scramble on the first day. And it's the kind of routing that you *never* see when he's doing the 10mph runs. Then, he always sticks right on the road, even if there's an easy parking lot to let him cut a tangent. The evidence is just too much. There are some that overlap. Apparently there are multiple reasons including time zone errors, concurrent bike segments, and concurrent RV segments. I will continue working on sorting it all out, but I figured some other people might find the current data helpful. The source I used only had the tracker data through June 9th, but I think we have the later data if anyone wants to add that. I think it would be interesting to add the strava data to this, and I might get to that some day if someone doesn't do it first. I also plan on adding a column to show rest time between runs. I had to estimate timezone changes, so feel free to double check me on those. If you make any changes to the doc, you might want to keep a backup version. I will keep a backup of the original. All you sleuths have made your point. Clearly this guy was faking his run across America. What point are you guys now trying to make by continuing this obsessive thread? This is outstanding! It looks just like the original. I remember that section, and the fact that they backtracked a little afterwards. I'm guessing they had a semi behind them blaring their horn or something. Lots of cross-country traffic in I-40. There's a reason they deleted that one. Buzzfeed seems like the likely type of reporting source that would lap this up. So they will lap up the RY fake too. RE: Executive Summary 6/30/2016 11:56AM - in reply to Ray & Stacey? Quite the observation. I'll bet there are no Matt, Smon, Sarah, Toby, Mel, Chris, or Dan. Unless Matt is Matt Lonsdale or Matt Tonks? No other possible repeats here. Maybe he just has a 3x6 hole in the bottom of the RV so he can run on the road while safely protected by the RV. Michael Johnson, Paavo Nurmi, Lasse VirÃ©n... they are all being outshone by this remarkable Robert Young.